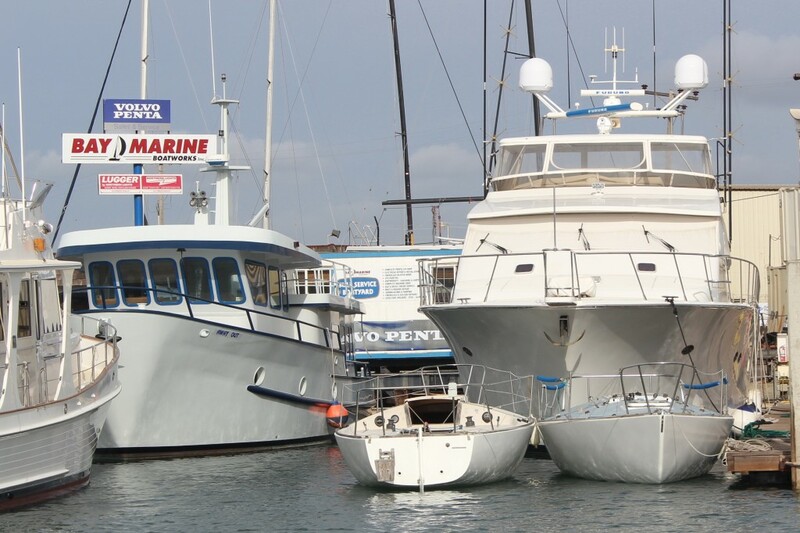 Last month we delivered Delos and Barney to Bay Marine for bottom painting. They’re back looking brand new! 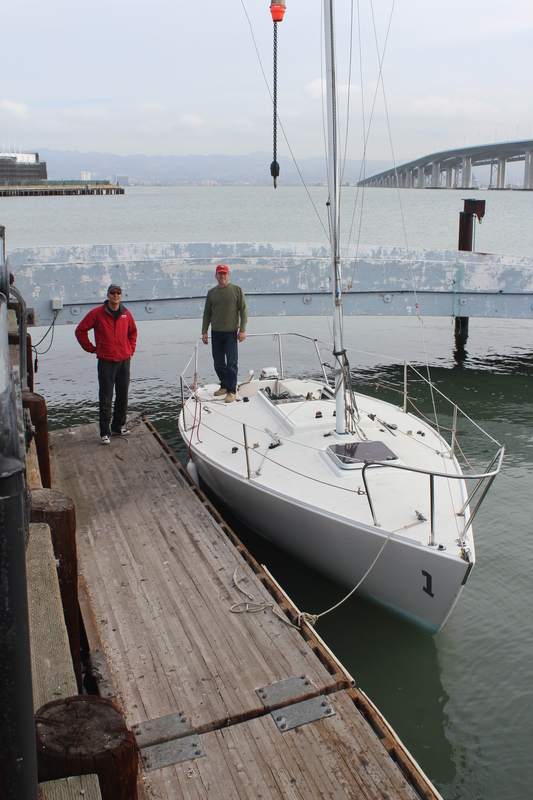 We swapped them with two more J/24’s before rain and wind announced winter’s arrival on Clipper Cove. Next step: stripes & graphics. Michael Weinman and I splashed Beefcakes and Blue Stripe last Monday. We were ahead of schedule after un-stepping the first mast. 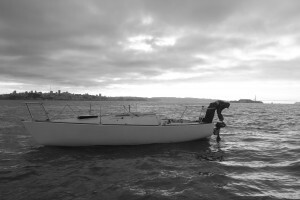 As with most boat projects sailing is not always smooth. 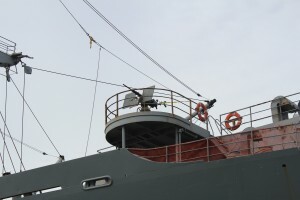 The mast on Beefcakes was stuck and would not budge. Jasper Van Vliet arrived for transit duty at 1030. 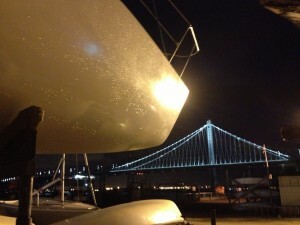 Additional attempts to remove the mast failed so we headed for Bay Marine. 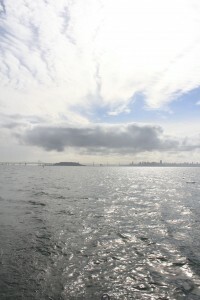 Jasper and I left Clipper Cove with clouds behind us and blue sky ahead of us. We were greeted by an enthusiastic welcoming committee as we rounded the entrance to Pt. Richmond harbor. 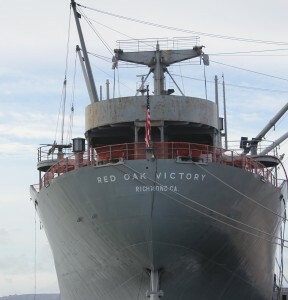 The SS Red Oak Victory, one of 534 Victory class Cargo ships built for WWII, served as a second waypoint. She was turned over to the Richmond Museum of History in 1998 after an act of congress in 1996. 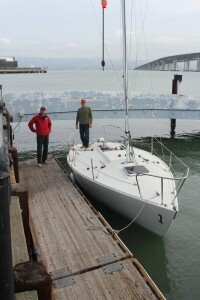 Two freshly-painted J/24s were launched and waiting for us. Our decision to transit Beefcakes with the mast up to save time proved to be a good call – the pros at Bay Marine and their industrial-strength crane made short work of the mast removal. The 90 minute return journey to TISC was cloudy. 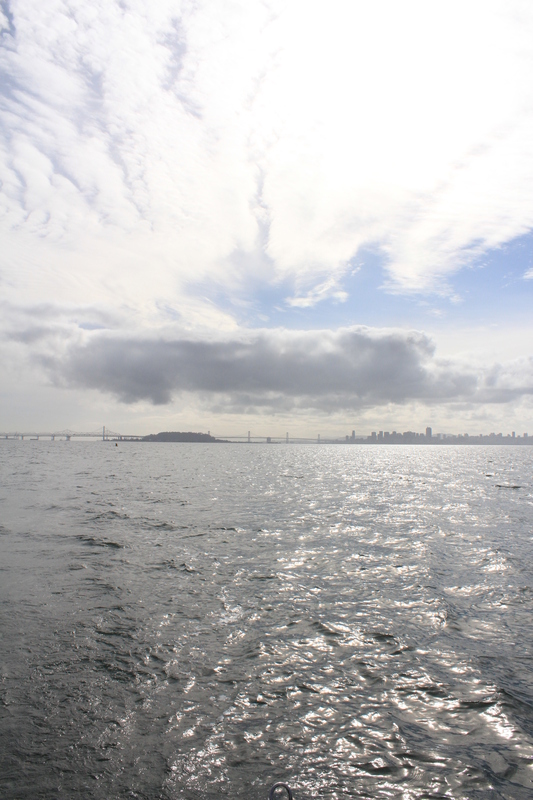 Winter is one of the few times we see clouds around here and they always seem gorgeous over SF Bay whether sky blue or stormy gray. 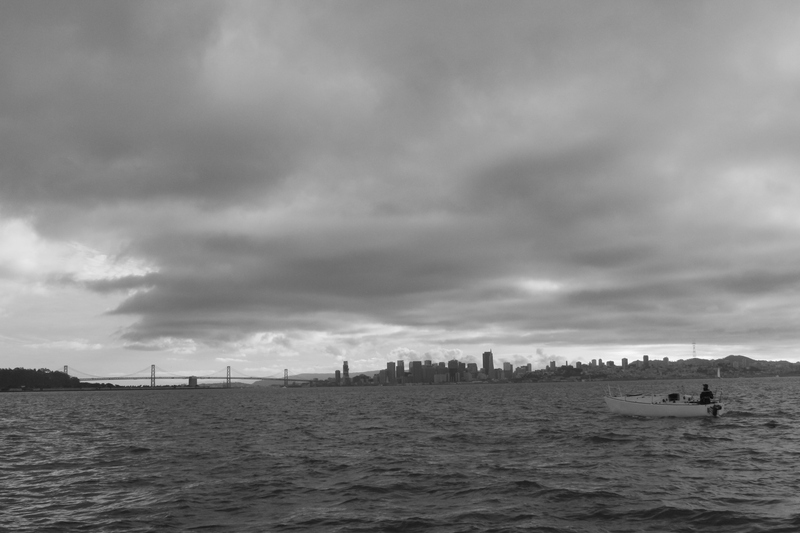 We completed our second refueling as we neared Treasure Island. Plenty of time to think about boat graphics on the way home with a brand new pearly-white hull on my starboard quarter for an hour. Our current thinking is a blue boot stripe, possibly an upper accent highlight, bow numbers, and CA registration number. And graphics. Bold graphics to showcase our refurbished fleet. The big questions are how to name the boats and which graphics would look best while remaining durable. Feel free to send along your thoughts or suggestions (daveg @ onclippercove . com). 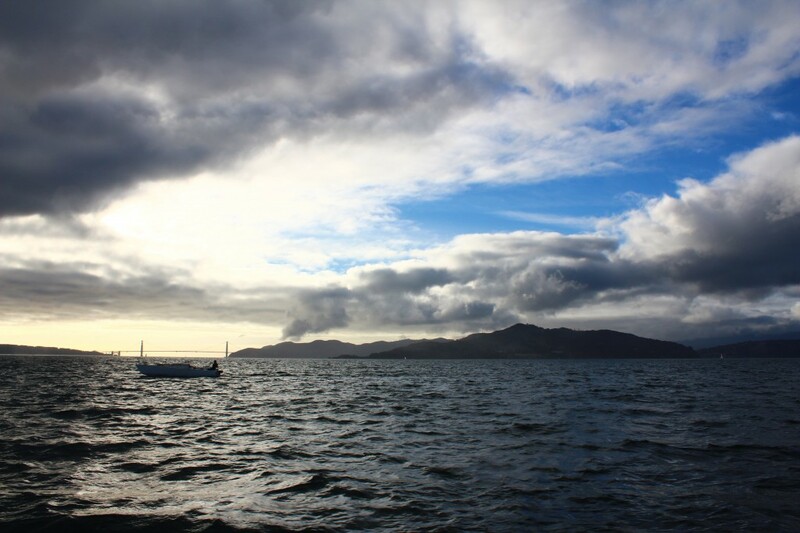 If you or your company would like to sponsor one or more boats and/or sails even better! Imagine how great your name/logo would look on the side of a J/24 with kids smiling as they learned life lessons on Clipper Cove. 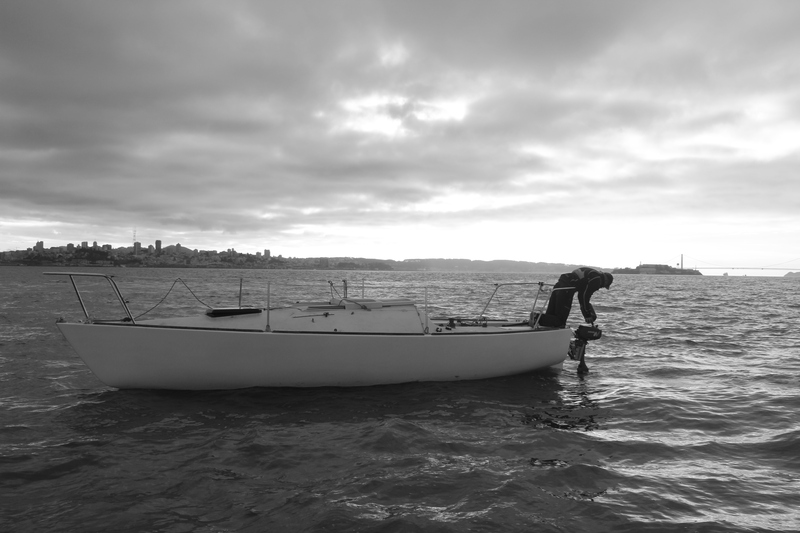 Even with help from the pros, favorable tides, and only one “hitch”, daylight ran out before we washed and retrieved both J’s. The reflection of the new Bay Bridge was another reminder of how attractive shiny these new hulls will be – especially with bold new graphics on their hulls. The history behind the SS Red Oak Victory is intriguing. 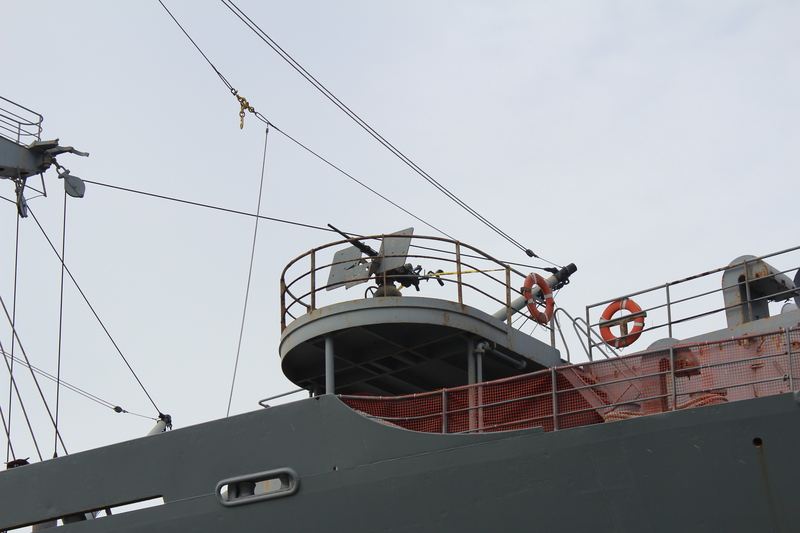 Here’s the link to a virtual tour of the ship. 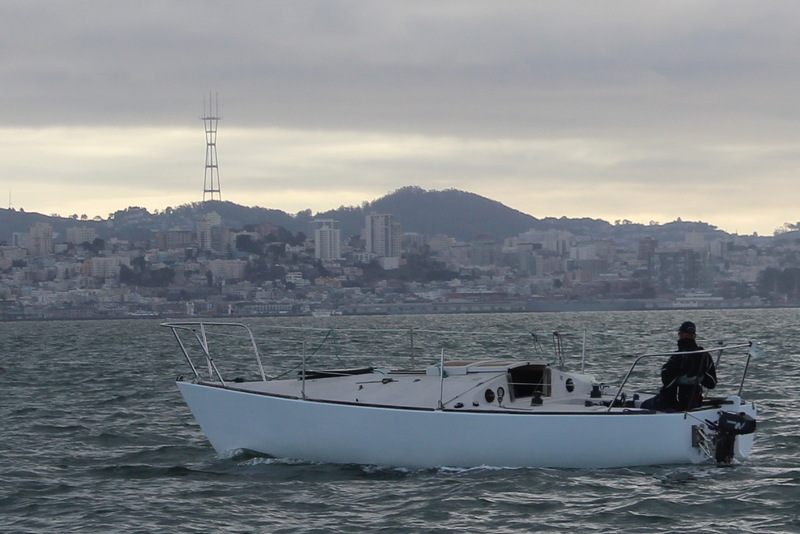 This entry was posted in Uncategorized and tagged Bay Marine Boatworks, Clipper Cove, J/24, non-profit, Richmond Museum of History, San Francisco Bay, SS Red Oak Victory, TISC, Treasure Island Sailing Center by skippersgift. Bookmark the permalink.